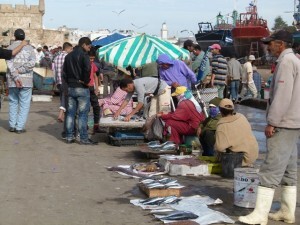 Essaouira is a very special place to include in your Morocco tours itinerary. This charming Atlantic coast fishing town is an UNESCO world heritage site which UNESCO describes as “an exceptional example of a late 18th century fortified town.” During the 18th and 19th centuries Essaouira was known throughout much of the world as the Port of Timbutku, for the fact that this was one of the terminuses of the fabulous Trans Saharan camel caravans. Before that it was home to the infamous Barbary Coast Corsairs. And if an old pirate port doesn’t capture your interest how about the fact more than a thousand years before the pirates, the Romans, Carthaginans and Phoenicians were here. So if you are thinking you can skip Essaouira because it is just another beachside town you will miss out on a real Berber Treasure. Of course the beach is lovely, but there is the fascinating old 18th century medina to wander through, the old city ramparts, complete with their avenue of 18th century Dutch canons, to stroll along for a magnificent view over the Atlantic ocean and coastline, the colourful working fishing port and other endless delights to discover. 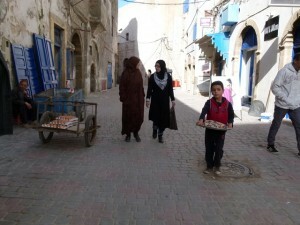 You could easily spend a couple of days here and still wish you had more time to enjoy here in Essaouira. 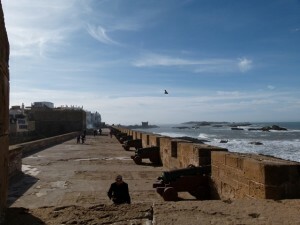 We hope you will have time to include Essaouira in your Morocco tour and only wish everyone had time to visit Essaouira in their Morocco tours. Many of our Berber Treasures Morocco tours deluxe cultural experience small group tours of Morocco travel to Essaouira (eg CE1, CE2, CE10E, CE9, CE11/CE11R, CE12/CE12R) and of course if you choose to take one of our custom designed private tours of Morocco – your tailor made Morocco tours itinerary can definitely include Essaouira and anywhere else you want to go; the only limitations are you time and travel budget. Email or call us now to discuss how best to include a holiday in Essaouira in your Berber Treasures Morocco Tours itinerary. 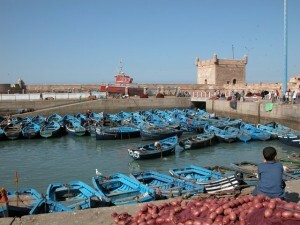 Many of our small group tours of Morocco travel to Essaouira.